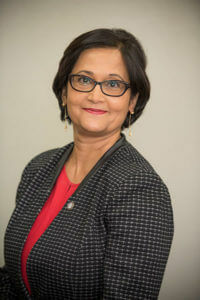 Tanuja Singh, D.B.A., Dean of the Greehey School of Business and Professor of Marketing, will be inducted to the 2017 San Antonio Women’s Hall of Fame later this month. “I am truly humbled and honored by this induction, especially as I look at those who are sharing this honor with me this year,” Singh said. “I am amazed by all those who came before me to pave the way for me to pursue my passion as an academic leader. This induction affirms my belief that if you do what you love, and you put your heart and soul into it, the world will notice. The San Antonio Women’s Hall of Fame was established in 1984 to honor outstanding local women leaders in our community who have made significant and enduring contributions in their respective fields. Also among the 16 women to be recognized is St. Mary’s alumna Paula Gold-Williams (B.B.A. ’84), President and CEO of CPS Energy. The San Antonio Women’s Hall of Fame will welcome inductees during an induction gala Saturday, March 25, at 6 p.m. at the Omni Colonnade.